Ronkonkoma, NY, USA, March 4, 2019 — Qosina, a trusted distributor of innovative CPC® quick disconnect couplings, now carries the full line of AseptiQuik® G and S Series connectors. 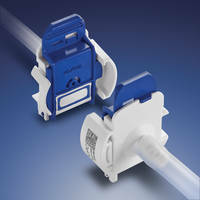 These connectors are ideal for providing easy sterile connections for small-flow applications—even in non-sterile environments. The G and S Series connectors boast a genderless design, which allows them to mate universally, simplifying system integration. Their intuitive, three-step Flip-Click-Pull function promotes reliable execution, reducing the risk of operator error. The robust construction eliminates the need for clamps, fixtures or tube welders, and the integrated pull-tab covers maintain sterility and ensure simultaneous removal of both membranes. Qosina will be conducting a live demo of the AseptiQuik® G and S Series connectors on March 12-13 at Booth 400 during the BioProcess International Conference & Exhibition at the Santa Clara Convention Center in Santa Clara CA.